Cover-to-Cover is a column where I’ll choose my favorite cover from a particular series. 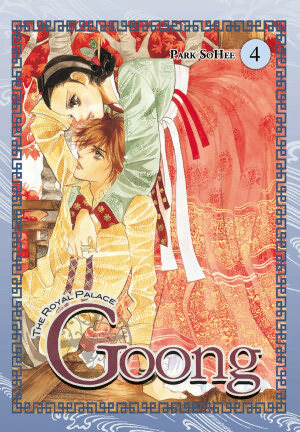 This time around it’s the first manhwa (Korean comic) I’ve ever read: Goong! Goong is a wonderful series that takes place in alternative version of modern Korea in which the monarchy still reigns over the country. Chae-Kyung, an ordinary 16-year-old girl, is arranged to be married to the cruel crown prince Shin because of a promise their grandfathers made long ago. As the two slowly learn to love each other, Chae-Kyung must adapt to the ways of the palace, while the threat of political turmoil is ever-present. With interesting characters, a great setting, and several well-balanced plot threads, Goong is an extremely addictive series. And while I’d probably still love Goong even if the characters were drawn as stick-figures, the series also benefits from having beautiful art. The character designs are sharp and attractive, while the costumes are detailed. Thus, choosing a favorite cover for this series is going to be tough. Immediately when I thought of which cover I liked best, the cover of volume three came to mind. The characters are in a great pose, and the energy of the cover matches the dynamic between Shin and Chae-Kyung really well. Chae-Kyung’s face is also very cute. Meanwhile, another cover that stands out to me is volume eleven‘s. While the pose Shin and Chae-Kyung are in is sort of cheesy, the colors are lovely and the characters are well-drawn. And yet, as I thought about which cover to choose, one volume’s cover kept coming back into my mind: volume four. When I saw the cover of volume four online, I didn’t think anything of it. It wasn’t until I saw the image in person that I realized how pretty it is. I think I’m a sucker for poses like this one: Chae-Kyung is kneeling over to embrace a sitting Shin, and it comes across as sweeter than any of the series’ other covers. What’s more, unlike several of the other covers that feature Chae-Kyung and Shin in modern clothing, volume four’s cover shows Chae-Kyung wearing traditional Korean attire worn by the female members of the royal family. I must admit, it took me awhile to warm up to the Korean costumes presented in the series – at first I thought they were kind of bulky and awkward. But since then they’ve grown on me, and the style has begun to suit Chae-Kyung as much as she is slowly beginning to become suited to her role as crown princess. Yet, even with as ornate as the cover of volume four, the couple here seems very quiet in comparison to the ‘spark’ they have on other covers, or even within the series itself. Even though Chae-Kyung and Shin constantly have trouble communicating their feelings for one another, it’s hard not to become swept up in the few tender moments they’ve had with each other. Volume four’s cover is probably the most intimate Goong has had yet – and that’s exactly why it’s my favorite cover. Looking back at the anime I watched and manga I read in 2011, one thing becomes apparent to me: I need to expand my horizons. I love romantic-comedy and slice-of-life shojo, but I rarely bother with other types of shojo anime and manga. The only magical girl anime I’ve watched have been Sailor Moon, Cardcaptor Sakura and Prétear, and this year I added Magic Knight Rayearth to the list. I’m fine with all-out fantasy series such as Fushigi Yugi and The Story of Saiunkoku, but for some reason I tend to get turned off when a series that is in a realistic setting or has a ‘slice-of-life’ tone has unrealistic or supernatural elements. 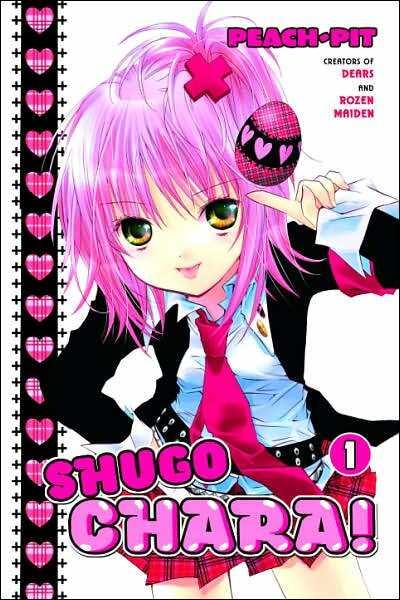 This has definitely caused me to miss out on series that are highly acclaimed: Shugo Chara! has always intrigued me – I love the art, especially the character design of Amu, the protagonist. I’ve read several positive reviews of the manga, but the whole thing about eggs that hatch into guardian characters has pushed me away from this sweet story of tweendom. I’ve heard nothing but good things about the Please Save My Earth manga but its sci-fi premise scared me off despite its intriguing tale of reincarnated lovers. And anime-wise, I’ve always been curious about Gakuen Alice, which has been compared to my favorite series Kodocha because both series are zany and have elementary-school aged protagonists. But the fact that the story is set in Alice Academy, a school for students who have magical powers, makes me wary of giving Gakuen Alice a chance. But it’s not just mystical undertones that have influenced my decisions not to get into certain series – there have been several series I thought had really interesting premises yet didn’t get into because they were Korean. The main title that comes to mind is Goong, a story in which monarchy is in charge of present-day Korea, and the prince is forced into an arranged marriage. I really like stories about political marriages, and it seems like Goong is the cream of the crop, but the simple fact that it is a Korean manhwa has kept me from reading it. I think it may be because I’m unsure of how different manhwa are (or aren’t) from manga that I haven’t tried any out yet. Or it could be that I’m afraid of opening a can of worms by discovering how many Korean titles I’d love to read and further adding to my wallet’s misery. I think my reluctance to try new genres is because I don’t like dropping series: I dread having to debate whether I should or shouldn’t continue an anime or a manga once I’ve found myself lukewarm to it, and I hate having incomplete series on my shelf. But in limiting myself, I’m sure I’m missing out on great series that I would really enjoy. So for 2012, I would like to start looking beyond my preconceived notions and step out of my comfort zone to try different types of anime and manga – especially within the realm of shojo.